Length of Waketime: Around 2 hours. I did find that sometimes she needed closer to 1.5 or 1.75 hours of waketime this month. That could possibly be due to illness or maybe just that she's adjusting to 2 naps a day still. It's safe to assume anywhere between 1.5-2 hours is what she does though. 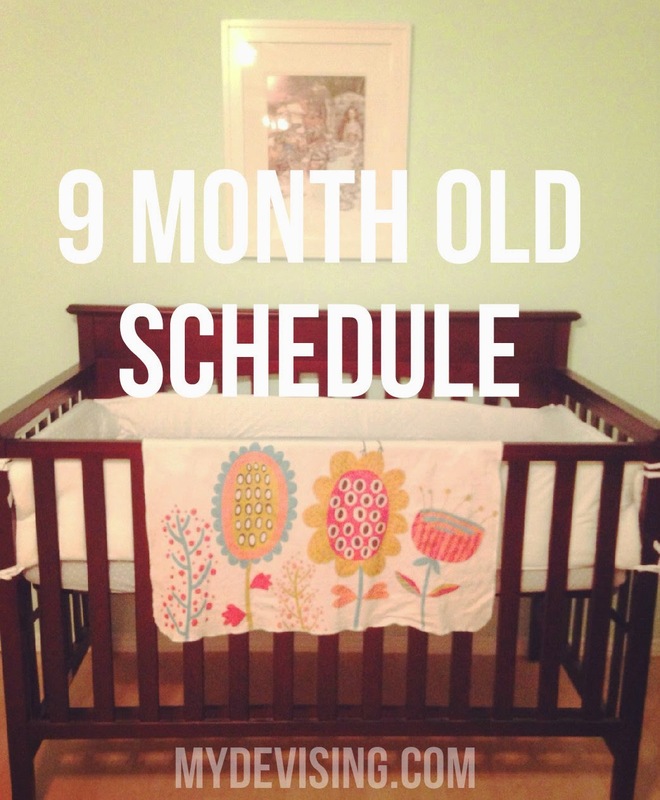 -Last month, I talked about how we had transitioned to 2 naps. There were a few days, however, that a 3rd catnap was needed if she didn't nap quite as long as expected. I just took it day by day and did what worked best each day. But officially, at 9 months, she is down to 2 naps except for Wednesdays. Those days are off because of Duke's school pick-up. Because her afternoon nap is cut short, she always goes down for a 3rd nap around 4:30. -We have just barely begun to venture into non-baby (pureed) foods. So far, she has tried pasta and rice. She is a fan of both! -She is now completely capable of picking up small foods (like puffs) and feeding herself. Now that she's learned that skill, we'll begin to slowly introduce more finger foods. -As of now, we'll start cutting out the rice cereal since we'll be adding in other foods. -Nova seems to be pretty sensitive to textures. She gags easily, so I know we will have to ease her into the process of more chunky foods. -She seems to have settled into a more predictable pattern with drinking 4-6 oz. of her bottles at each feeding. It's not always that amount, but for the most part, that's what she takes.